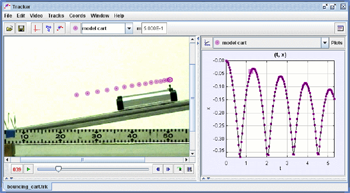 Video analysis and modeling tool to be used in physics education, added to Video directory. Tracker video modeling is a powerful new way to combine videos with computer modeling. Manual and automated object tracking with position, velocity and acceleration overlays and data. Interactive graphical vectors and vector sums. RGB line profiles at any angle, time-dependent RGB regions. Model Builder creates kinematic and dynamic models of point mass particles and two-body systems. Model overlays are automatically synchronized and scaled to the video for direct visual comparison with the real world. New Data Tracks use data from external models including EjsS simulations. Free Xuggle video engine plays and records most formats (mov/avi/flv/mp4/wmv etc) on Windows/OSX/Linux. QuickTime video engine also supported on Windows and OSX. Video filters, including brightness/contrast, ghost trails, and deinterlace filters. Perspective filter corrects distortion when objects are photographed at an angle rather than straight-on. Radial distortion filter corrects distortion associated with fisheye lenses. Export Video wizard enables editing and transcoding videos, with or without overlay graphics, using Tracker itself. Video Properties dialog shows video dimensions, path, frame rate, frame count, more. Fixed or time-varying coordinate system scale, origin and tilt. Multiple calibration options: tape, stick, calibration points and/or offset origin. Switch easily to center of mass and other reference frames. Protractors and tape measures provide easy distance and angle measurements. Circle fitter tool fits circles to 3 or more points. Define custom variables for plotting and analysis. Add editable text columns for comments or manually entered data. Data analysis tool includes powerful automatic and manual curve fitting. Export formatted or raw data to a delimited text file or the clipboard. OSP Digital Library Browser provides easy access to online collections of videos and Tracker resources. Use the DL Browser to find resources by name, author, keywords or other metadata. Use the DL Browser to create, edit and share your own video and resource libraries. Use Tracker to export self-documenting ZIP resources ideal for the DL Browser. Full undo/redo with multiple steps. Page view displays html instructions or student notes. User preferences: GUI configuration, video engine, default language, font size, more.